So anyways, it was Valentines Day lunch, and, old romantics that we are, we’d chosen to spend it with a couple of close friends- who are so newly togethered that they shouldn’t have been spending it with the three of us! It’s easy not to know about this part of town. Unless you’re into theatre- or history- most tourists well get as far as the Harbour Bridge, or perhaps Dawes Point Battery, and go no further. In the Depression, this area used to be part of what they called the Hungry Mile, where labourers would come to try and get a days work on the wharves. It was home to South Sea trading and whaling companies, shanty homes and bond stores. Now it’s full of expensive apartments, expensive moorings, and arts companies. It’s also home to last weekend’s Weekend Eat destination- Ventuno. I’ve been here a few times before, but never with family and never with these particular friends…so it passes the no repeat test. Knowing it was Valentines Day, I’d booked a couple of months ago, and managed to snaffle for us what is arguably the best table in (or outside) of the house. Check out that view. 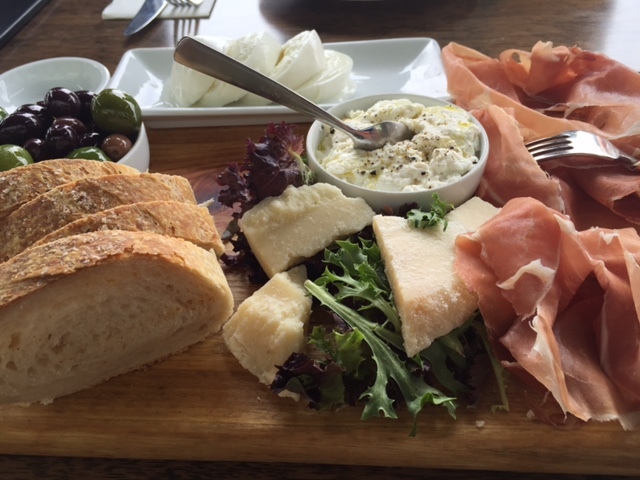 To start, we shared an antipasto platter: Prosciutto di San Daniele, Buffalo mozzarella, ricotta, parmesan cheese, marinated green Sicilian and black Gaeta olives, and not nearly enough homemade wood fired bread. Although we were sharing between 5, they had still put 4 slices of bread and 4 slices of mozzarella on the platter. Ventuno specialises in wood-fired pizzas- real thin crust pizzas with well thought through toppings. 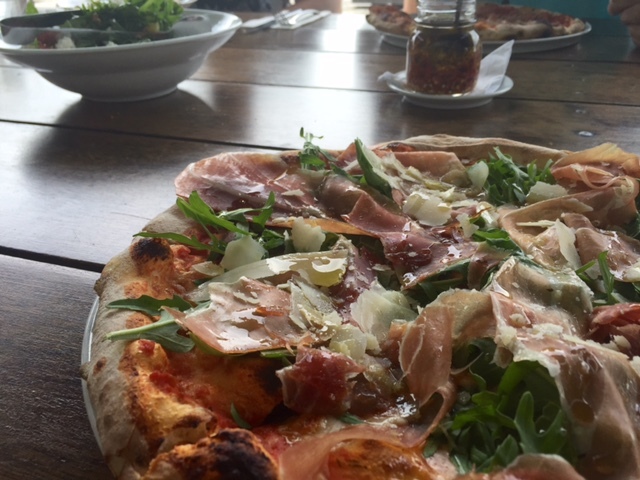 I had the Estate- tomato, fior di latte, Prosciutto di San Daniele, rocket, shaved parmesan. Perfecto. Ventuno is an easy walk here from The Rocks. 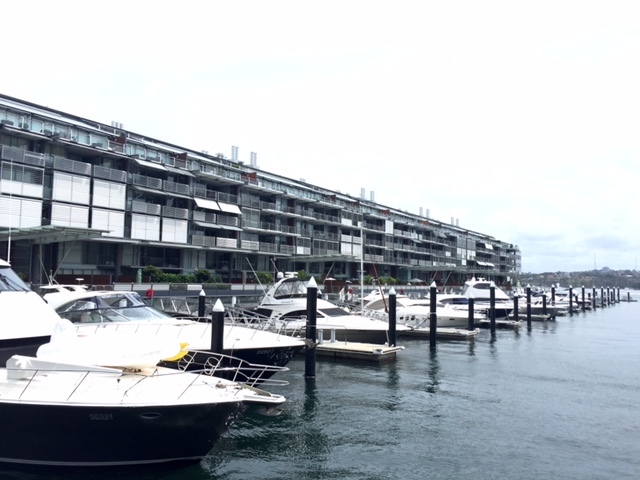 Head to the Park Hyatt, walk under the Harbour Bridge and just keep going until you get to the finger wharves. If you must drive there is metered parking (the parking police are brutal) along Hickson Road. We walked down Kent Street through the older part of town. The danger with this was, the temptation call of a beer at the Lord Nelson- Sydney’s oldest continually licensed hotel. 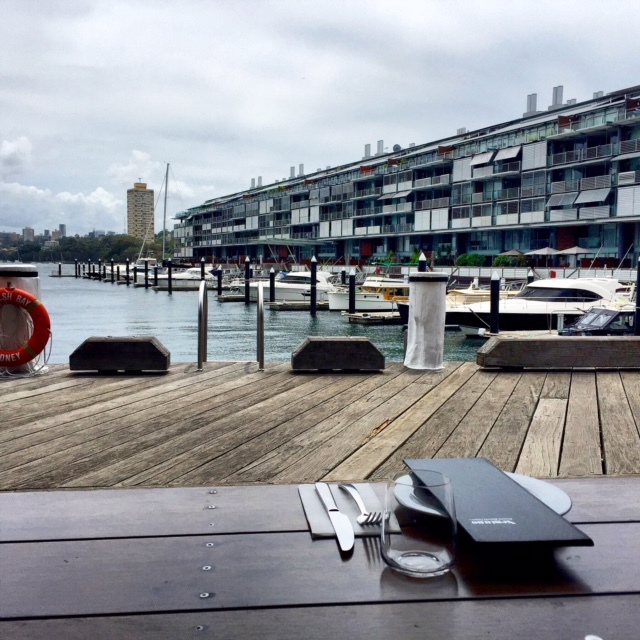 Sydney Theatre Company and Sydney Dance Company are located down here, making it the perfect location for a pre-theatre or dance lunch or dinner….or to while away an afternoon. Each time I’ve been here, there’s also been hens or birthday functions spilling out onto the wharf. Dream a little dream of real estate and boats. As Miss 16 quipped- you know you’ve made it when you have a boat on a boat.